Cala Saona is a beautiful sandy bay on the western side of Formentera. It is one of the most sheltered Formentera beaches, with rocky headlands on both sides that protect it from the wind. You still get the same fantastic blue waters here, and a pure white sandy beach which is a good size, so there’s room for everyone even on the busiest days. Cala Saona has a shallow bay which is perfect for swimming and if you need food or drinks, there’s 3 beach bars that surround the bay including hotel Cala Saona if you’re craving a cocktail or two. And if you’re feeling energetic, you can hire Kayaks here on certain days, or try a walk to Torre La Gavina. 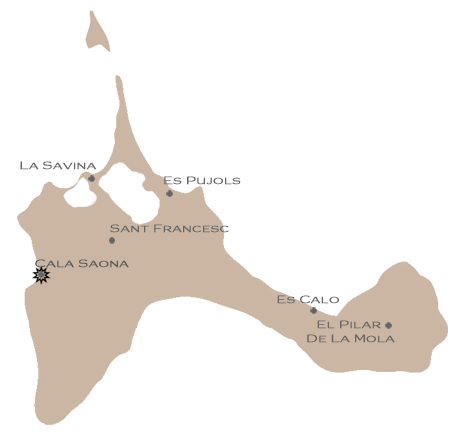 You can get to Cala Saona by catching a bus from the port or Sant Francesc, or drive yourself. Head out of Sant Francesc towards Cap de Barbaria, and turn right just before the bar Es Cap. Follow the road to the end and park in the field to your right as you arrive. The road to Cala Saona is sealed all the way, so is easily reached if you do not want to venture on to gravel roads. Check out our closest villas which are a short stroll from here: Casa Las Brisas & Casa Dos Torres. 0.9 km to Cala Saona. 0.8 km to Cala Saona. 4 km to Cala Saona.